Lineage. Constituted 405th Fighter Squadron on 25 May 1943. Activated on 15 Jul 1943. Inactivated on 10 Nov 1945. Redesignated 190th Fighter Squadron, and allotted to ID ANG, on 24 May 1946.190th Fighter Squadron (SE) extended federal recognition on 13 Oct 1946. 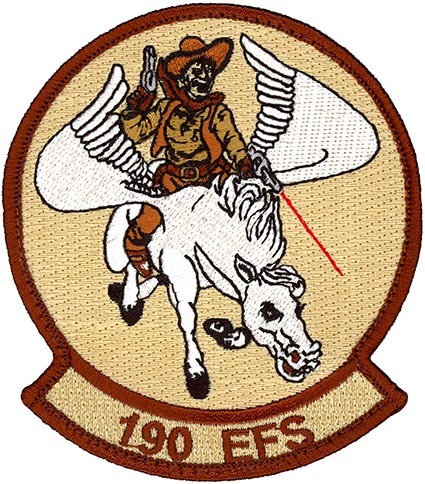 Redesignated: 190th Fighter-Bomber Squadron on 1 Apr 1951; 190th Fighter-Interceptor Squadron on 1 Jan 1953; 190th Tactical Reconnaissance Squadron on 18 Oct 1975; 190th Tactical Fighter Squadron on 15 Oct 1991; 190th Fighter Squadron on 15 Mar 1992-. Aircraft. P-47,1943-1945. P-51, 1946-1953; F-86, 1953-1954, 1959-1964; F-94, 1954-1956; F-89, 1956-1959; F/TF-102, 1964-1975; RF-4, 1975-1991; F-4, 1991-1996; A-10, 1996-. Decorations. Distinguished Unit Citation: Germany, 15-21 Mar 1945. Cited in the Order of the Day, Belgian Army: 6 Jun-30 Sep 1944.